The succession crisis in Algeria continues to spill ink after former French Ambassador Bernard Bajolet claimed that ailing President Bouteflika is artificially maintained alive. This statement comes as voices with vested interest in the regime are calling for a fifth term for President Bouteflika whose public appearances are a thing of the past. Bajolet who served as chief French external intelligence agency (DGSE) delivered a scathing criticism of the Algerian regime at an interview with Le Figaro, saying that the Algerian President is artificially maintained alive. “President Bouteflika, with all the respect I feel for him, is kept alive artificially. And nothing will change in this transition period,” he said. Prominent Algerian politicians and intellectuals expressed outcry as the Algerian regime prepares a fifth term for Bouteflika who is now confined to a wheelchair. The President who recently underwent medical checkups in Switzerland amid a cholera outbreak in his country is seriously ill and his voice is barely intelligible. 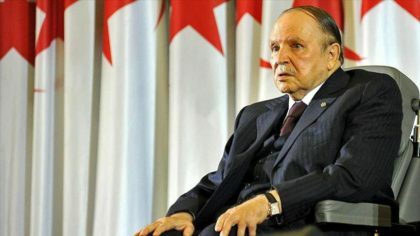 Bouteflika has been frail since suffering a stroke in 2013, which weakened his mobility and forced him to work from his residence in Zeralda, west of Algiers. Analysts deem that maintaining a sick President whose physical and mental capacities are shrouded in uncertainty is indicative of a power struggle within the country’s regime. The contending clans within the regime seem not in agreement over Bouteflika’s successor. Therefore, they maintain the ailing 80-year old President as a time buying measure in a sign that bodes ill for the country’s future. Bouteflika’s health also casts a shadow on the opacity of a regime, where power is generally presumed to reside among groups of military leaders, intelligence officials, businessmen, and politicians collectively known as Le Pouvoir. Uncertainty over Bouteflika’s succession adds to Algeria’s explosive mix: ailing economy, dwindling oil revenues, widespread corruption, fragile social cohesion and lingering terrorist threat, which make the country a powder keg waiting to explode.